BackupEDGE will automatically detect all databases and tables supported by one MySQL server and display a count of tables and databases detected. 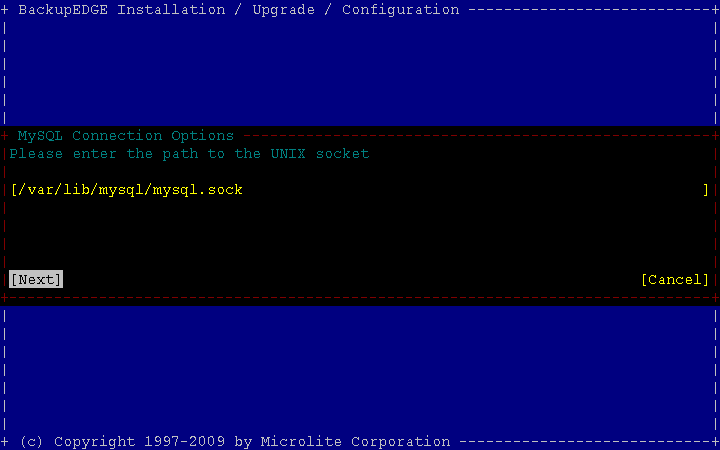 It will then create a BackupEDGE Domain called mysql that includes this information. You may (and are encouraged to) review and edit this information, to see if BackupEDGE’s autodetector has done something sane in your installation. This can be done via the Domain Editor. 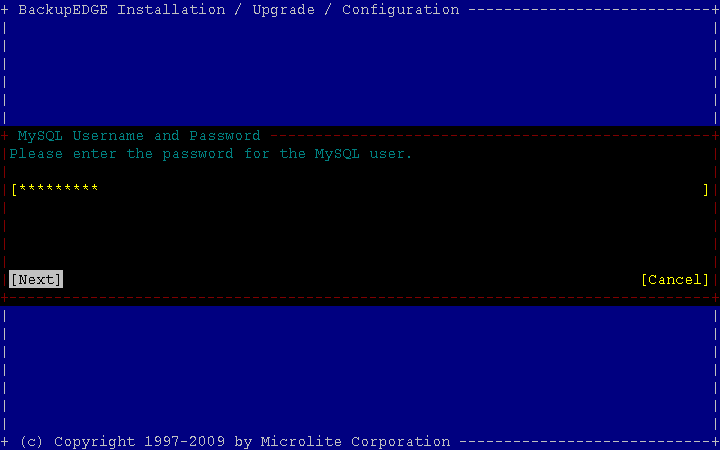 MySQL Online Backup Support is not available under BackupEDGE for Xinuos SCO OpenServer 5. 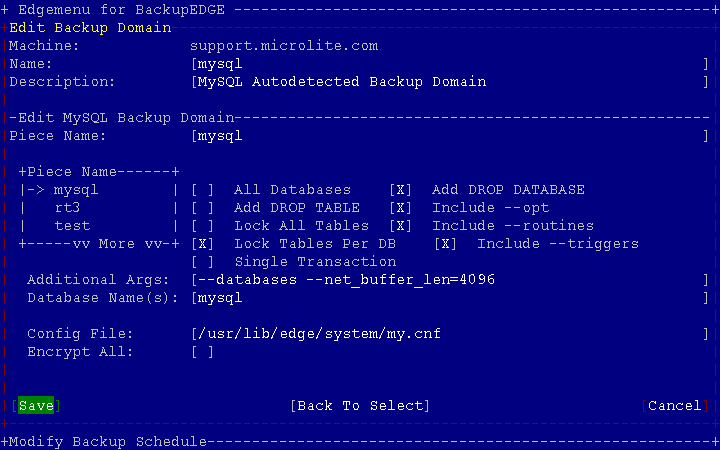 By default, BackupEDGE creates one Domain for MySQL backups. The domain further subdivides your MySQL data into what are called ‘pieces’. Each piece will ultimately correspond to a single file on the archive (i.e., you can choose to restore one piece independently of the next). Further, by default, each piece corresponds to a single database. While you may change this default setup in the domain editor, it is important to realize that it exists. Note that each piece represents a call to the mysqldump utility. BackupEDGE cannot perform a level-2 verification of MySQL data, since it is assumed that the data in the MySQL server will change. This data will be level-1 verified, even if the backup job specifies level-2 verification. Other data, such as filesystem data, will be verified via level-2 as always. You should review the settings that BackupEDGE will use during backup by using the Domain Editor. To access this, enter EDGEMENU, use Setup:Enable Advanced, then Schedule: Create/Edit Domain. We would like feedback about how to improve the autodetector’s default configuration as part of this beta. 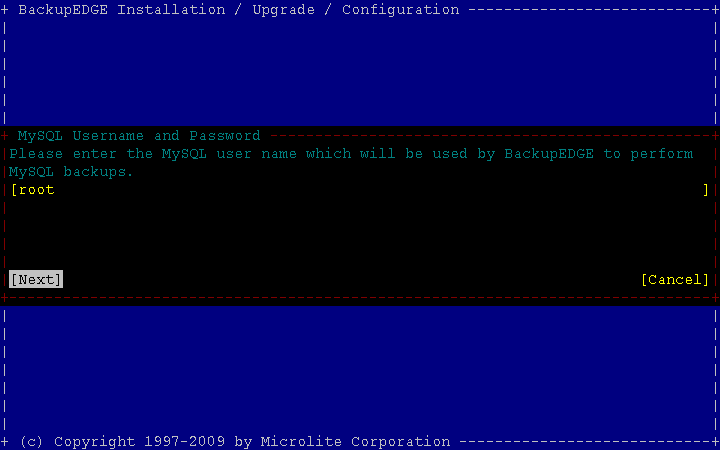 BackupEDGE can perform only Master Backups of MySQL data. Differential and Incremental backups do not affect MySQL at this time. Binary log backups are not supported. 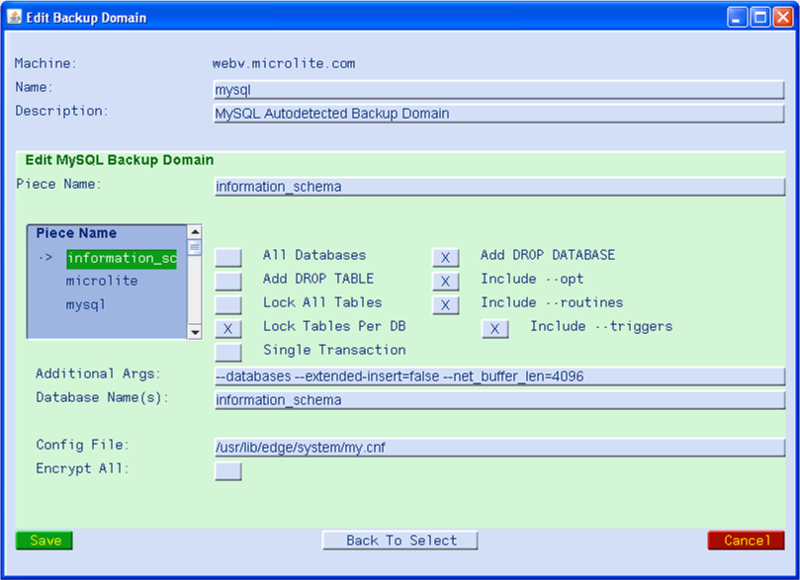 During a disaster recovery, you may not restore MySQL backups until after you have rebooted, via EDGEMENU. Note that it may be necessary, especially with InnoDB™ tables, to take some corrective action before performing the restore. This is because InnoDB tables sometimes do not restart cleanly after an unclean shutdown without additional steps. Note that if you have backed up all tables from all databases, then you can simply remove all tables and databases and restore them all from your archive. Restores might fail until you do this, complaining that the connection to the MySQL server has been lost. 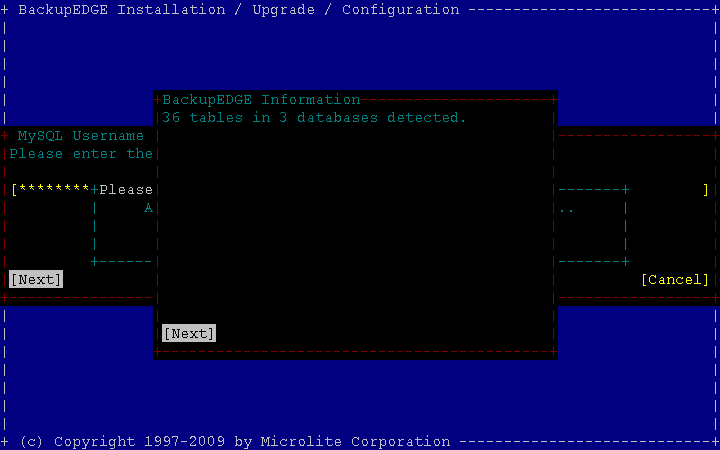 As mentioned earlier, by default, BackupEDGE backs up each database separately. For each, if all tables are InnoDB tables, then it will wrap the entire backup in a single transaction, else it will lock all tables to ensure consistency. Note that in the former case, exactly what consistency guarantees a transaction provides depends on how you have configured transaction isolation in the MySQL server. 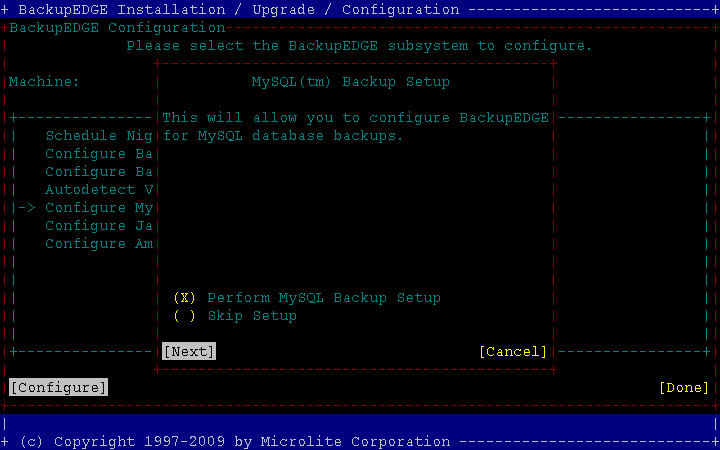 If you use EDGEMENU, EDGE.RESTORE, or the EDGE command line to restore your MySQL data, then BackupEDGE will put the data directly into MySQL via the mysql command. 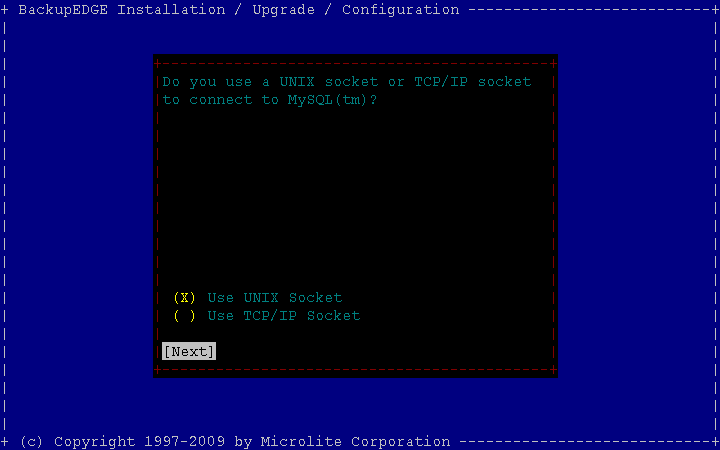 If you would like to restore the SQL commands to disk, you may do so via the EDGE command line. Contact beta3@microlite.com for more information about this. Remember, there are different "database engines" available in MySQL. The most popular are the older MyISAM and the newer, transaction-safe InnoDB. If ALL tables in a database are handled by InnoDB, BackupEDGE defaults to transaction mode while backing, meaning that the database will go into what is essentially a snapshot mode and we'll back up all tables from a point in time while the database continues to operate as normal (with lower performance) with other users. If ANY table in a database is not InnoDB, that particular database will have its tables locked (together) during the database backup, meaning other users' commits will be blocked and they will have to wait until the locks are released. The default is the best strategy WE could find. Users should modify to their own preference in the MySQL Domain editor.